PVMBG reported that observers at the Gamkonora observation post in Gamsungi (6 km NW), West Halmahera, reported that during 1 January-6 March diffuse white plumes rose up to 150 m above the crater rim, although weather conditions often obscured views. RSAM values fluctuated; higher values during mid-January through February were due to increased tremor and tornillo-type earthquakes. The Alert Level remained at 2 (on a scale of 1-4). Residents and tourists were asked not to venture near the crater within a radius of 1.5 km. Tremor and emissions had been reported by the Pusat Vulkanologi dan Mitigasi Bencana Geologi (PVMBG) during mid-2011 through mid-2012 (BGVN 37:04). An eruption described by PVMBG and the UN's Humanitarian Early Warning Service (HWS), a service of the Inter-Agency Standing Committee (IASC), took place on 23 January 2013. PVMBG reported that it was a phreatic eruption on preceded by increased seismicity. Specifically, an increase in volcanic earthquakes (VA), followed by an increase in shallow volcanic earthquake (VB) and "tornillo-type" earthquakes. During March-April 2013, seismic signals increased. Towards the end of March the number of VA earthquakes increased followed by an increase in VB earthquakes in late April. Harmonic tremor increased in early May. On 24 May seismicity indicative of shallow magma movement increased and diffuse white plumes reached 100-300 above the crater. On 25 May a gas plume rose from the crater. During 25-27 May denser white-to-gray plumes rose 200-500 m above the crater rim. On 27 May the Alert Level was raised to 3; residents and tourists were asked not to venture near the crater within a radius of 3 km. PVMBG reported that the Gamsungi post observers noted diffuse white plumes rising 300 m above the crater rim during 27 May-30 June 2013. Seismicity declined overall, but a seismic crisis characterized by continuous tremor occurred on 10 June; tremor was absent during 13-30 June. The Alert Level was lowered to 2 (on a scale of 1-4) on 1 July; residents and tourists were asked not to venture near the crater within a radius of 1.5 km. Petrology of 2007 eruptive products. The 2007 eruption was andesitic in nature. The event occurred after 20 years of dormancy and prompted the evacuation of 8,000 residents living near the volcano. PVMBG scientists examining the eruption also posted deformation, petrologic, and other data. Chemical analysis showed that samples from lava tops, a lava peak, a lava dome, a pyroclastic flow, and a bomb were all andesite, with SiO2 values between 53.62 and 56.91% (by weight). Information Contacts: Center of Volcanology and Geological Hazard Mitigation (PVMBG), Jalan Diponegoro 57, Bandung 40122, Indonesia (URL: http://www.vsi.esdm.go.id/); Darwin Volcanic Ash Advisory Centre (VAAC), Bureau of Meteorology, Northern Territory Regional Office, PO Box 40050, Casuarina, NT 0811, Australia (URL: http://www.bom.gov.au/info/vaac/); Humanitarian Early Warning Service (HEWS), a Service of the Inter-Agency Standing Committee (IASC) (URL: http://www.hewsweb.org/). PVMBG reported that observers at the Gamkonora observation post in Gamsungi (6 km NW), West Halmahera, reported that during 1-15 November diffuse white plumes rose up to 100 m above the crater rim. RSAM values fluctuated; tremor continued to be elevated. The Alert Level remained at 2 (on a scale of 1-4). Residents and tourists were asked not to venture near the crater within a radius of 1.5 km. PVMBG reported that observers at the Gamkonora observation post in Gamsungi (6 km NW), West Halmahera, reported that during 1 August-3 November diffuse white plumes rose up to 70 m above the crater rim. RSAM values fluctuated; an increase was detected in October coincident with a period of increased tremor. The Alert Level was lowered to 2 (on a scale of 1-4) on 1 July. Residents and tourists were asked not to venture near the crater within a radius of 1.5 km. CVGHM reported that observers at the Gamkonora observation post in Gamsungi (6 km NW), West Halmahera, reported that during 27 May-30 June diffuse white plumes rose up to 300 m above the crater rim. Seismicity declined overall, but a seismic crisis characterized by continuous tremor was detected on 10 June; tremor was not detected during 13-30 June. The Alert Level was lowered to 2 (on a scale of 1-4) on 1 July. Residents and tourists were asked not to venture near the crater within a radius of 1.5 km. CVGHM reported that a phreatic eruption at Gamkonora on 23 January was preceded by increased seismicity. Some types of seismic signals increased during March-April while others decreased. On 24 May seismicity indicative of shallow magma movement increased and diffuse white plumes rose 100-300 above the crater. During 25-27 May dense white-to-gray plumes rose 200-500 m above the crater. On 27 May the Alert Level was raised to 3 (on a scale of 1-4). Residents and tourists were asked not to venture near the crater within a radius of 3 km. CVGHM reported that on 7 September the Alert Level for Gamkonora was lowered from 3 to 2 (on a scale of 1-4). CVGHM reported that during January-April diffuse white plumes from Gamkonora rose 25-100 m above the crater rim. Seismicity increased during 29 April-3 May. On 1 May, white plumes rose 150 m above the crater rim. The next day, white plumes rose 300 m above the crater rim and incandescence from the crater was observed. Residents near the volcano's base noted a sulfur smell. The Alert level was raised to 2 (on a scale of 1-4). On 23 March, CVGHM lowered the Alert Level for Gamkonora from 2 to 1 (on a scale of 1-4) based on visual observations and decreased seismicity since January. Diffuse white plumes rose 50-150 m above the crater. Residents and visitors were reminded not to approach or climb the crater. CVGHM reported that seismic activity from Gamkonora increased on 24 March. The Alert Level remained at 2 (on a scale of 1-4) and visitors were reminded not to approach or climb the crater. CVGHM lowered the Alert Level for Gamkonora from 3 to 2 (on a scale of 1-4) on 24 July based on visual observations and a decrease in seismicity. That followed a sharp drop in seismicity during 8-23 July, a decline both in terms of the number of events and their energy. Later, during 16-23 July, when breaks in inclement weather took place, observers saw white plumes rising to altitudes of 5.6 km (18,400 ft) a.s.l. Available CVGHM reports issued through the 26 July did not disclose more recent events. CVGHM reported that on 10 July, incandescent material from Gamkonora was propelled about 5 m above the summit and intermittently showered the flank. On 11 July, ash plumes rose to altitudes of 5.9-9.4 km (19,400-30,800 ft) a.s.l. During 12-15 July, visual observations of ash plumes were hindered by cloud cover. On 16 July, the Alert Level was lowered from 4 to 3 (on a scale of 1-4) due to a drastic decrease in seismic activity, a decline in ash plume altitudes, and the absence of incandescence observed at the summit during 11-15 July. On 8 July, a phreatic eruption from Gamkonora produced an ash plume that rose to an altitude of 1.8 km (5,900 ft) a.s.l. The plume drifted N and ashfall was reported from villages as far as 7 km downwind. The Alert Level was raised to 2 (on a scale of 1-4). On 9 July, seismic activity increased and eruption plumes rose to altitudes of 2.1-2.6 km (7,000-8,500 ft) a.s.l. The Alert Level was raised to 3. Later that day, ash plumes rose to an altitude of 5.6 km (18,400 ft) a.s.l. and the Alert Level was raised to 4. During 9-10 July, incandescent material was propelled 5-50 m above the crater. On 10 July, booming noises were followed by ash plumes that rose to 4.1 km (13,500 ft) a.s.l. About 8,400 people evacuated from villages within an 8 km radius of the volcano. Explosive activity from the summit crater began about 0900 on 19 July. The eruption apparently began with the ejection of incandescent tephra, followed by about 1.5 hours of ash emission. An eruption cloud rose about 700 m and ash fell 5 km S of the summit, where 1-1.5 mm accumulated. Occasional felt earthquakes continued after the 19 July ash ejection ended. More than 3,500 people fled the area. Smaller explosions occurred on 22 July at about 0400 and 1800, accompanied by booming noises heard in a village at the NNW foot of the volcano, 5 km from the summit. Glow was visible over the crater at night. A VSI team arrived on the island immediately after the second explosion. After the team issued an evaluation, the evacuees returned to their homes. Local officials reported that the summit crater had occasionally emitted thick "smoke" since March. Information Contacts: A. Sudradjat, S. Suparto, Suratman, VSI; Antara News Agency, Jakarta; AFP. Since 6 April, Gamkonora had shown signs of restlessness. On 13 April, a dark plume, probably containing ash, was observed at 1130, reaching 700 m height. Small explosions occurred on 21, 24, 25, and 26 April, with reports of minor ashfall on the flanks. No plume heights were available, owing to poor weather. A VSI observer has been sent to Gamkonora. Previous activity was reported on 16-17 February 1983. According to the Center of Volcanology and Geological Hazard Mitigation (CVGHM), on 8 July 2007 a phreatic eruption from Gamkonora (figure 1) produced a white-gray ash plume that rose to an altitude of 1.8 km. The plume drifted N, and ashfall was reported from villages as far as 7 km downwind. The Alert Level was raised to 2 (on a scale of 1-4). The only two previous Bulletin reports on Gamkonora, in 1981 and 1987 (SEAN 06:07 and 12:04), described eruptions generating plumes that rose to less than 1 km above the vent. Figure 1. Geology of the island of Halmahera showing the locations of Dukono, Gamkonora, and Gamalama volcanoes. The map distinguishes volcanoes into three groups based on the time of last eruption: erupted since 1900; erupted earlier than 1900 but within 10,000 years before present (BP); and uncertain date of eruption. Courtesy of Volcano World (map by Grant Davey and Dan Olberg, PT Nusa Halmahera Minerals). On 9 July 2007, seismic activity increased and, according to the Darwin Volcanic Ash Advisory Centre (VAAC), eruption plumes rose to altitudes of 2.1-2.6 km. The Alert Level was raised to 3. Later that day, ash plumes rose to an altitude of 5.6 km, and the Alert Level was raised to 4. On 9 July, the Hawai'i Institute of Geophysics and Planetology (HIGP) Thermal Alerts System identified a 1-pixel thermal anomaly recorded by the MODIS Terra satellite. This was the only thermal anomaly measured for this volcano since the beginning of 2007. No further thermal anomalies were measured from 10 July to 27 November 2007. During 9-10 July, incandescent material was propelled 5-50 m above the crater and intermittently showered the flank. On 10 July, booming noises were followed by ash plumes that rose to an altitude of 4.1 km. About 8,400 people were evacuated from villages within an 8 km radius of the volcano. Visual observations of ash plumes during 12-15 July were hindered by cloud cover. On 16 July, the Alert Level was lowered from 4 to 3 due to a significant decrease in seismic activity, a decline in ash-plume altitudes, and the absence of summit incandescence. On 24 July CVGHM further lowered the Alert Level to 2 based on visual observations and another decrease in seismicity. Later, during 16-23 July, when breaks in inclement weather took place, observers saw white plumes rising to altitudes of 5.6 km. Available CVGHM reports issued through late 2007 did not disclose further events. According to Saut Simatupang, the head of Indonesia's Volcanological Survey, local flights on surrounding islands were affected. Longer distance domestic flights to eastern Indonesia were not disrupted. Information Contacts: Center of Volcanology and Geological Hazard Mitigation (CVGHM), Jalan Diponegoro 57, Bandung 40122, Indonesia (URL: http://vsi.esdm.go.id/); Darwin Volcanic Ash Advisory Centre (VAAC), Bureau of Meteorology, Northern Territory Regional Office, PO Box 40050, Casuarina, NT 0811, Australia (URL: http://www.bom.gov.au/info/vaac/); Hawai'i Institute of Geophysics and Planetology (HIGP) Thermal Alerts System, School of Ocean and Earth Science and Technology (SOEST), University of Hawai'i, 2525 Correa Road, Honolulu, HI 96822, USA (URL: http://modis.higp.hawaii.edu/); Volcano World (URL: http://volcano.oregonstate.edu/). Previous Bulletin reports on Gamkonora highlighted an eruption in 1981, minor explosions in April 1987 (SEAN 06:07), and a phreatic eruption in early July 2007 (BGVN 32:10). Reports by the Center of Volcanology and Geological Hazard Mitigation (CVGHM) noted tiny diffuse white plumes in 2009 and again in 2011 when the observatory recorded an average of 2 volcanic earthquakes per day. During mid-2011 through mid-2012, in addition to intervals with several shallow volcanic earthquakes per day, instruments also recorded increasing tremor and hundreds of signals of inferred emissions described as hot-air blasts. The hazard status rose accordingly and remained elevated as this report goes to press on 29 June 2012 at Alert Level 3 (on a scale of 1-4). As this report goes to press a potentially inaccurate news report indicated an eruption starting 13 June 2012 (see subsection below). That behavior remained unconfirmed by CVGHM or the Darwin Volcanic Ash Advisory Centre (VAAC) as discussed further in a subsection below. Figures 2-4 provide broad regional context on Gamkonora near the northern margin of Indonesia. A previous map (figure 1 in BGVN 32:10) shows Gamkonora and other Holocene volcanoes on a map of Halmahera and adjacent islands. Figure 2. Indonesian volcanoes with eruptions since 1900 A.D. as compiled from Simkin and Siebert (1994) by Lyn Topinka (USGS-Cascades Volcano Observatory). Halmahera island and Gamkonora volcano appear in the upper (N) part of the map (see figures 3 and 4). Courtesy of the USGS. Figure 3. Gamkonora and the situation there associated with unrest in July 2007 (BGVN 32:10). Note the globe showing Indonesia at upper right. On the main map, most of the unshaded and unlabeled islands situated NW of Gamkonora belong to the Philippines. Courtesy of Relief Web. Figure 4. A UNOSAT product made 12 July 2007 addressing Gamkonora's crisis around that time. The scale and details highlight the local setting; the box at upper left mentions 2004 population estimates and notes that there were 35,000 residents within 20 km of the volcano. Courtesy of UNOSAT. CVGHM reports were scarce during 1982-2011. One report noted that seismic activity increased somewhat on 24 March 2008. The increase included an episode of continuous tremor. On 23 March 2009, CVGHM lowered the Alert Level from 2 to 1 based on visual observations and decreased seismicity since January. Diffuse white plumes rose 50-150 m above the crater. Residents and visitors were reminded not to approach or climb into the crater. CVGHM reported that during January-April 2011, diffuse white plumes rose 25-100 m above Gamkonora's crater rim. Seismicity increased during 29 April-3 May 2011. On 1 May, white plumes rose 150 m above the crater rim. The next day, white plumes were observed rising 300 m above the crater rim and observers saw incandescence from the crater. Residents near the volcano's base noted a sulfur smell. On 3 May 2011 the Alert level was raised to 2. Various types of earthquakes were noted during January to April 2011. They included shallow volcanic earthquakes (2 per day average), deep volcanic earthquakes (once per day average), local tectonic earthquakes (1-7 per day average), and far tectonic earthquakes (4 per day average). A 13 June 2012 CVGHM report noted that during May and June 2012 the emissions were sparsely to medium white in color and rising 75 to 200 m above the crater rim. Absent were sulfurous smells, open flames, eruptive noises, and other similar anomalous symptoms. The same CVGHM report noted that seismic signals since 3 May 2010 included emission signals (hot-air blasts, averaging 10-12 daily), harmonic tremor (averaging 10-15 events daily), shallow volcanic earthquakes (averaging 2 daily, but for the one specific case given, during the interval 31 May to 11 June 2012, only 1 occurred), and distant tectonic earthquakes (averaging 4 daily). Table 1 presents a breakdown of the interpreted seismic signals during 1 May to 12 June 2012. Table 1. Seismic data released on 13 June 2012 for Gamkonora. The entries represent total events during specified intervals during May and early June 2012 ("--" signifies absence of data). Courtesy of CVGHM. The authors of the 13 June report made no further comment about the air-blast signals that had become common at the volcano (table 1). They did note that since the beginning of May 2012, tremor had increased. They interpreted this and the overall seismicity as due to magma intruding upward and approaching shallow depths within the volcano. The authors noted that intrusions could lead to increased pressure within the volcano, although they viewed this pressure as yet relatively small. As previously noted, starting on 3 May 2011, the volcano's hazard status rose to Alert Level 2. On 3 May 2012 it rose to Level 3, where it remained at least as late as 29 June 2012. The Level 3 status excluded residents, visitors, and tourists from approaching closer than 3 km from the summit. The report also prompted local governments to coordinate with the volcano's monitoring post, which is located in the village of Gamsungi (or with CVGHM's main office in Bandung). News claims of eruption on 13 June 2012. The English language version of Antara News released a report (edited by Ella Syafputri) at 1913 on 13 June stating that Gamakonora had erupted that afternoon. The eruption, if it did occur, escaped clear mention in available CVGHM reports. The news report said that the eruption sent a plume of undisclosed type or color 3 km "into the sky" (a term that could imply a plume to 3 km altitude or could mean a plume 3 km over the ~1.6 km summit, in effect to ~4.6 km altitude). The news report said the event had the effect of "forcing hundreds of residents living on the volcano's slope to evacuate to safer areas." Despite the headline "Mount Gamkonora erupts" and directly under that, the sentence "The volcanic ash spread to as far as Tobelo, the capital of North Halmahera district", the two quotes referred to events at two separate volcanoes. In the 5th paragraph of the article the topic shifted to Dukono, another volcano in the region, which turned out to have been the source of the ash (not Gamkonora). The news report spawned no fewer than 10-20 English-language reports on as many websites. Some of these derivative reports continued to mistakenly attribute Dukono ashfall to Gamkonora, and in some cases they added further errors. Reference. Simkin, T. and Siebert, L., 1994, Volcanoes of the World: a Regional Directory, Gazetteer, and Chronology of Volcanism During the Last 10,000 Years. (2nd ed.) Geoscience Press, Tucson, 368 pp. Information Contacts: Center of Volcanology and Geological Hazard Mitigation (CVGHM), Jalan Diponegoro 57, Bandung 40122, Indonesia (URL: http://www.vsi.esdm.go.id/); Lyn Topinka, United States Geological Survey, 1300 SE Cardinal Court, Bldg. 10, Suite 100, Vancouver, WA, 98683; UNOSAT (URL: https://unitar.org/unosat/); Darwin Volcanic Ash Advisory Centre (VAAC), Bureau of Meteorology, Northern Territory Regional Office, PO Box 40050, Casuarina, NT 0811, Australia (URL: http://www.bom.gov.au/info/vaac/); Antara News (URL: http://www.antaranews.com/en/news/). The shifting of eruption centers on Gamkonora, the highest peak of Halmahera, has produced an elongated series of summit craters along a N-S trending rift. Youthful-looking lava flows originate near the cones of Gunung Alon and Popolojo, south of Gamkonora. Since its first recorded eruption in the 16th century, typical activity has been small-to-moderate explosive eruptions. Its largest historical eruption, in 1673, was accompanied by tsunamis that inundated villages. Supriatna S, 1980. Geologic map of Morotai quadrangle, north Maluku. Geol Res Devel Centre Indonesia, 1:250,000 scale map and 10 p text. Verstappen H Th, 1964. Some volcanoes of Halmahera (Moluccas) and their geomorphological setting. Ned Aardr Gen, 81: 297-316. There is no Deformation History data available for Gamkonora. Gamkonora volcano, seen here from the NW coast near Gamsungi village, is one of Halmahera's more active volcanoes. The summit crater of Gamkonora is elongated in a N-S direction, with a small crater lake at the north end. The first two historical eruptions, in 1564 or 1565, and in 1693, were the most severe, producing respectively a destructive lava flow that reached the sea, and a tsunami that inundated villages. 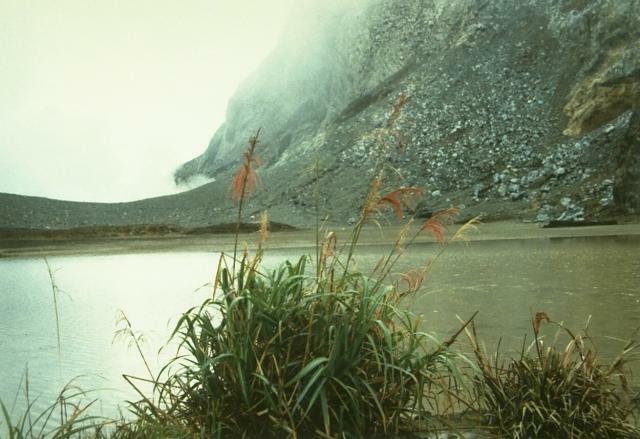 Photo by A. Solihin, 1984 (Volcanological Survey of Indonesia). 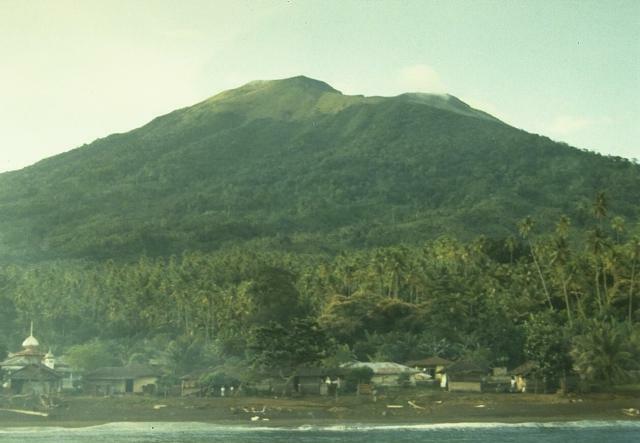 Gamkonora volcano on Halmahera Island contains a summit crater elongated in a N-S direction that has been the source of historical eruptions since the 16th century. A small 100 x 150 m crater lake occurs at the north end of the summit crater complex. Large Eruptions of Gamkonora Information about large Quaternary eruptions (VEI >= 4) is cataloged in the Large Magnitude Explosive Volcanic Eruptions (LaMEVE) database of the Volcano Global Risk Identification and Analysis Project (VOGRIPA).